Residents and businesses nearby the development site are advised that a scheduled Pepco outage will occur beginning this Sunday, Oct. 28 at 10:00 p.m. and concluding Monday, Oct. 29 at 6 a.m. as contractors perform necessary electrical work. This temporary outage is only expected to affect Tastee Diner, Woodmont Grill, and the businesses immediately across Norfolk Avenue during these non-business hours. In case of inclement weather, the outage may be delayed 24 hours and another notice will be shared via these emails and posted to our website, MHQBethesda.com. For any questions, please contact development@MHQBethesda.com. Meanwhile, the construction phase of the Marriott International Headquarters development site continues. Equipment and material deliveries, environmental and safety controls, excavation, hauling and drilling operations continue as trucks enter and exit the site along Woodmont Avenue. 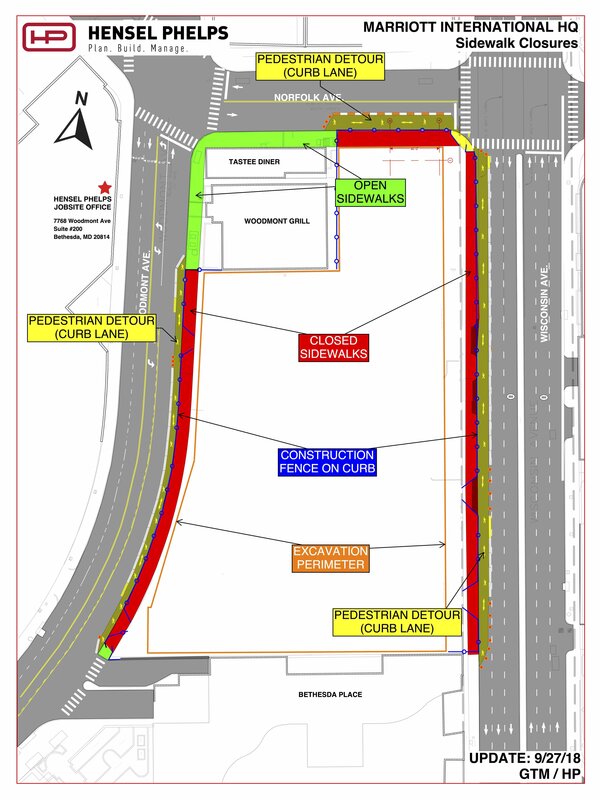 To minimize any potential disruptions to pedestrian and vehicular traffic, a phasing plan has been implemented and every attempt is being made to keep trucks within the development site perimeter. Lane and sidewalk closures remain in place along sections of Woodmont, Norfolk and Wisconsin Avenues. These closures provide access for construction activities, as well as safe pedestrian passage. As a reminder, please pay close attention to the posted signage and be alert for flaggers, as they are there for the safety of all of us. 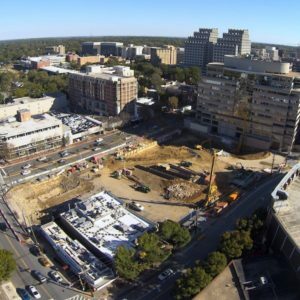 You can see a live construction camera featuring a 24/7 time-lapse view of the development site. For questions, contact Barney Silver, Vice President, Construction at Boston Properties; or Gavin McDuff, Area Superintendent at Hensel Phelps. Please send your email to: development@MHQBethesda.com.